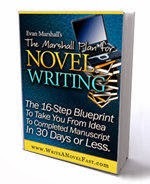 When I first read literary agent Evan Marshall's book The Marshall Plan® for Novel Writing in 2009 (before I was published) -- I tried to use his system to make a novel outline using paper in a notebook. (This was my review, back then). It didn't work out for me, mainly because I write romance (which has very specific formulas of sorts, that can't be put into a system that has the romantic involvement as secondary). He's created software that follows the principles of his book, and offered it to me for free to try out and write about it. ***None of the links are affiliate links, btw. 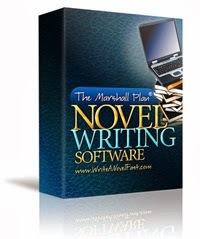 This is a brand-new version of The Marshall Plan® Novel Writing Software for both Windows and Mac. Personally, I really don't outline. I'll write a one page synopsis to sell a book, but that always changes as I write. I know that if I'm going to write a romance novel, then my book starts with two people who are not together, and ends with them in love and living happily ever after. I've found that my stories naturally fall into three acts, with a game-changer at the end of act 1, one in the middle, and one at the end of the middle (before the last act). If I hadn't read Marshall's book I might not even be aware that's what I was doing. Some writers are outliners/plotters. I sort of wish I was, as well, because then I wouldn't have to go back and change the beginning of every single book I wrote when I hit the end. Alas, I'm a pantser. That one time I tried Marshall's outline, not only did I not finish the outline, but I didn't write the book. At all. The story felt all used-up to me. I like discovering what will happen as I write. It keeps it fresh and fun and interesting, even if it involves more clean-up work at the end when it's time to edit. So... do I recommend this software? Not if you write romance. And not if you hate outlining. But if outlines are your thing, and you're writing some other genre fiction that's not romance, it might work for you. I really wish there was an option to change the outline to fit the romance genre more easily, because writing an outline for a book with a romance subplot won't work. One big issue I found: if you decide to change your wordcount, you will actually lose entire sections you may have already filled in. The data will be lost. One good thing about his outlining system is it will help writers remember to have a reaction scene after something big happens, and to keep track of alternating POV characters. The last three books I wrote (The Pulse Trilogy - book 1 releases November 25th from Simon & Schuster/Pocket Star) - I had so many different characters and POVs and surprises/game-changers etc that I'm *still* unsure how I kept track of it all. My copyeditor made this crazy-long style sheet to keep track of it herself. I wish I could say that I tried the software, was able to successfully plot out a book, and then write it. But instead I just looked at each section and thought "that'll come out as I write" - because that's what happens for me. That's me, not everyone. Your mileage may vary. Put simply, even though I read his book four years ago when I was brand new to all of this, I am not his target audience now. I've already got a method that works for me -- it's messier than his way, but it works. However, if you're overwhelmed by the complexity of writing a full novel (and that's okay! It's not easy! ), then this type of hand-holding through the outline could work really well for you. I bet after doing it once or twice, the rhythm of what should come where and when and how will come naturally. In summary... read the book first. Marshall knows what makes a book fast-paced and what looks good to publishers. But he doesn't necessarily know how your individual author-brain works (my brain just wants a blank MS Word doc). If you like his book and want to try his outlining method, then I suppose it makes sense to do it using the software. The software costs $149 and has a 30 day guarantee, per the website. Scrivener is a very versatile writing software. You can build an outline with a template you develop or simply set up note cards to store ideas and keep track of plot lines. The writer adds literature review paragraph, an appendix and rearranges the entire essay: the structure of its paragraphs to have logical sense, have a peek at the web page here to find more useful information. Cover Reveal for The Pulse!